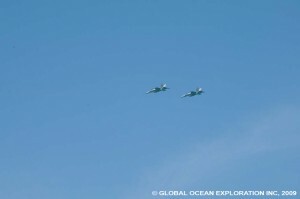 No ocean going expedition is without its risks and I learned firsthand about this on August 23rd. I woke up not feeling great but with the change in environment, schedule and food, I didn’t think much of it. Plus I am young, fit and healthy…nothing could medically happen to me out here except maybe some kind of physical injury. But as the day progressed and I felt worse and worse, I found out that I could not have been more wrong as, by 8pm, I found myself being medevaced off of the ship. 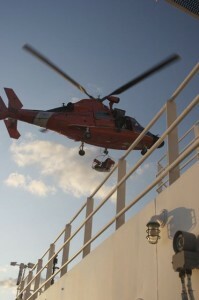 In the early evening, it was determined that I needed to get off the ship and to a hospital. Fortunately, we were close to shore (approximately 30 miles- the closest I have ever been on an expedition) and a Coast Guard Helicopter was dispatched from New Orleans. 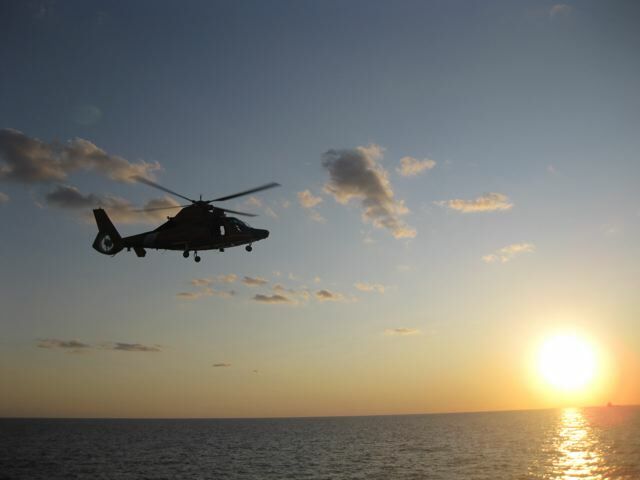 Right around sunset, the chopper arrived, the swimmer was lowered and I was soaring in a basket over the Gulf of Mexico being lifted into the chopper. 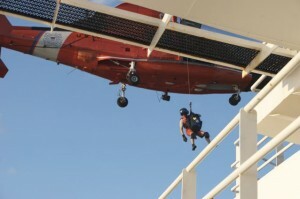 The ride took about an hour and we landed on the roof of the hospital where they began to administer care. It turned out that I had a major internal bleed from my stomach and had lost over one third of my blood by the time I had gotten there. I was very lucky to be in such close proximity to land. The crew of the NOAA Ship Ronald H. Brown was incredible in how quickly they got me off of the ship and I am forever thankful for their swift action. Heartfelt thanks to the crew of the NOAA Ship Ronald H. Brown, the science team of the Lophelia II cruise, the US Coast Guard (especially the crew of the helicopter from the CGAS New Orleans), and the docs and nurses at Tulane Medical Center. 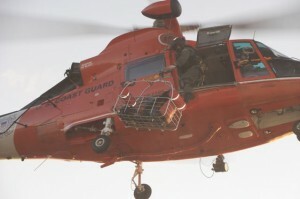 The Coast Guard Swimmer being hoisted back into the helo. 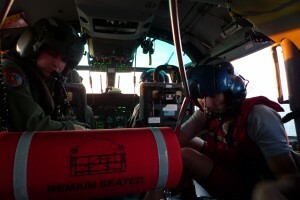 This entry was posted in Deep Sea Corals and tagged Gaelin Rosenwaks, helicopter, medevac, new orleans on September 8, 2009 by Gaelin. 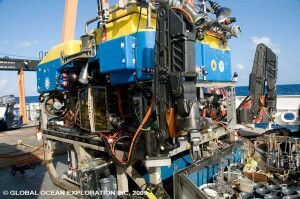 August 22: Deep Dive…2500m…What will we find? 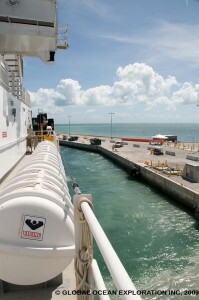 At 1600, I head out on deck to go to the van for my watch but it is pouring! I grabbed my raincoat and made my way to the van just before a huge crash of thunder. It is dark inside the van with screens everywhere. Jason II is equipped with cameras to get views from all angles of the vehicle. It is pretty awesome and I am immediately enthralled. It was very cool to watch the science cam in the lab but seeing all of the angles gives a complete feeling of what is going on below. It is much easier to post some of the video than to try to explain it. So here are two videos, one assembly of Lophelia and some very cool critters and the other of this awesome octopus we saw while I was on watch. 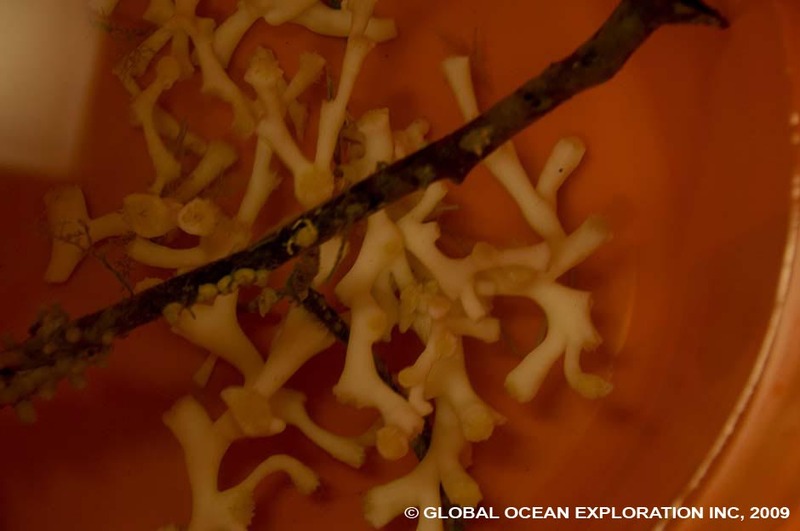 This entry was posted in Deep Sea Corals and tagged Deep Sea Corals, Gulf of Mexico, jason, octopus on September 8, 2009 by Gaelin. 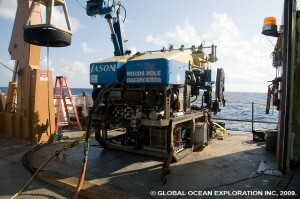 After twenty hours of bottom time, the Jason II ROV surfaced filled with samples. Perhaps one of the most interesting things about these samples is that they were collected individually so there is video of the collection and the scientists in the control van knew what was in every container. It is a fantastic way to sample because in the past, destructive trawls were used to study the deep sea. The trawl would go along the bottom and collect everything and anything in its path. 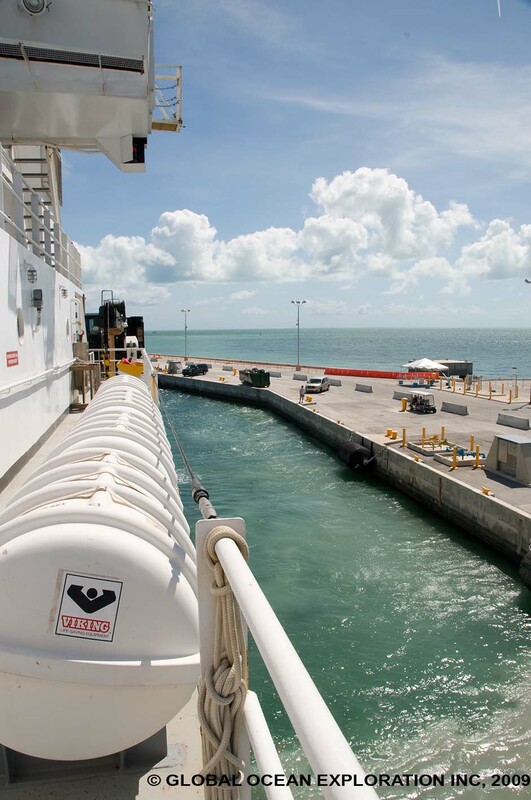 The entire deployment could be watched throughout the ship on the TVs so we all had a good feel for the site. Very cool stuff…big fish, crabs, squid, squat lobsters, and many types of both hard and soft coral were observed. It is incredible to see these animals interacting in their habitat. Corals become habitat for other animals and with the cameras on Jason, we can observe this behavior and interaction. 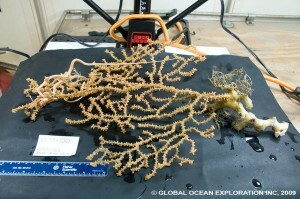 Brittle stars wrap themselves around soft corals, gargonians. 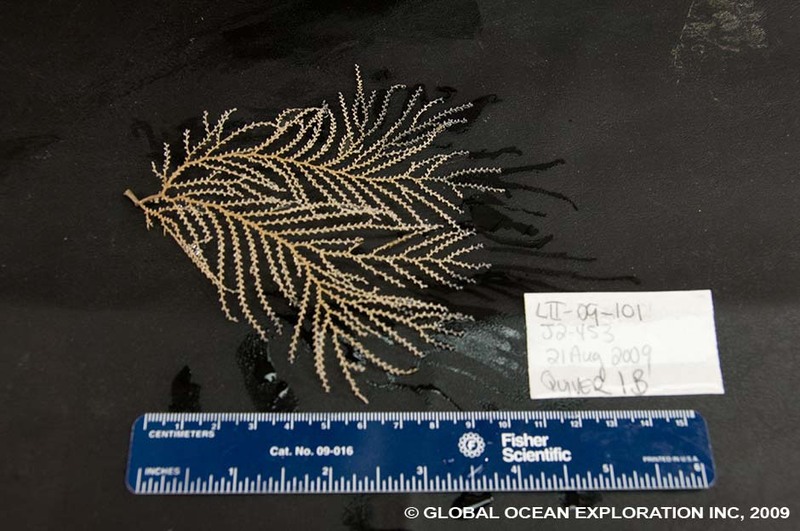 Crinoids, feather stars, find their homes on the corals as well. The focus of this cruise is the Lophelia coral, a beautiful white coral with enormous polyps, well for coral enormous. The Lophelia creates habitat for many small critters. 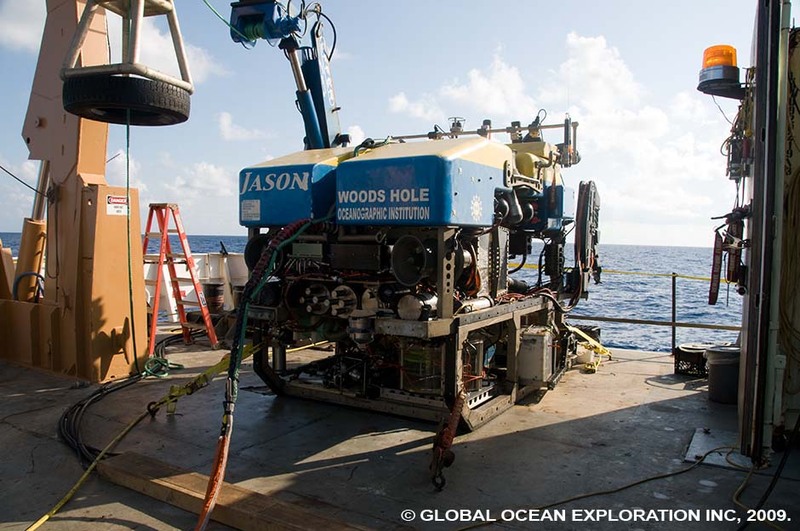 So with a successful mission, Jason came back on board and it was time to preserve and record all of the samples. I got an up close look at many of the animals which was very cool. I am struck by the scale of the cameras on Jason. Everything looks so huge in the cameras but most everything is relatively small, at least in this area on the West Florida Shelf. 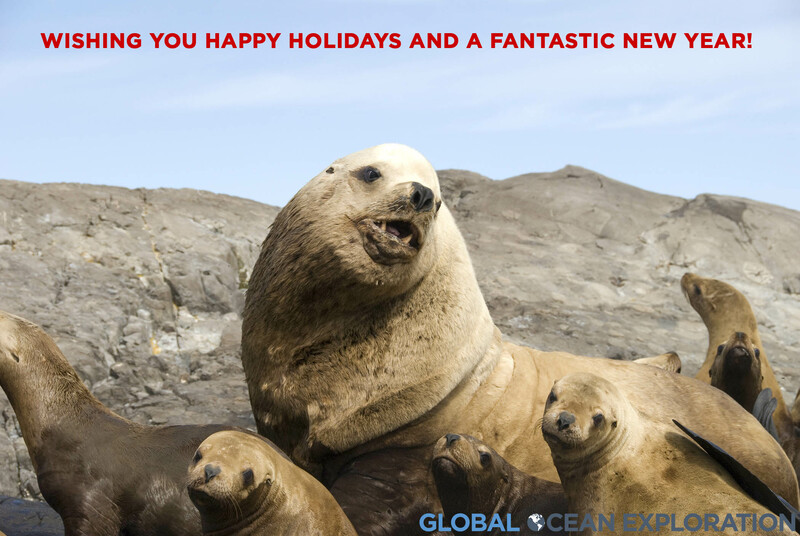 I am looking forward to the dives at all of the other sites to see what is different and what we find. As soon as Jason came up and all of the other navigation instruments were on board, we headed north to our next station…the steam should be about seventeen hours. 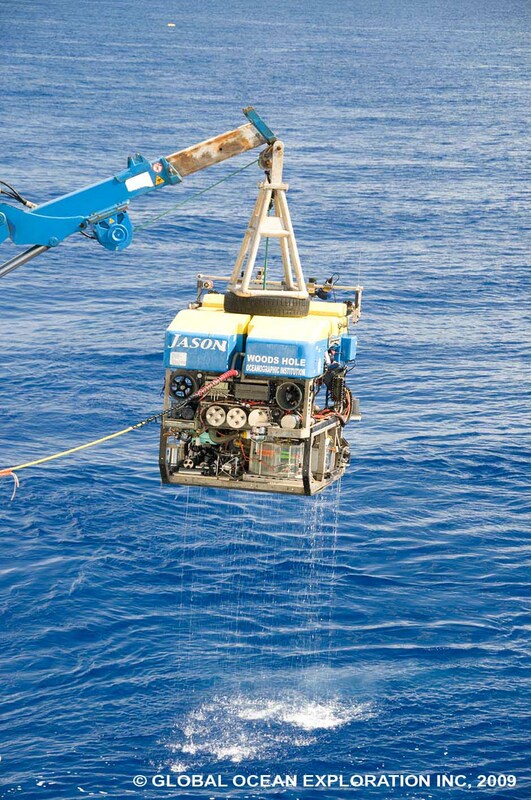 This entry was posted in Deep Sea Corals and tagged deepsea corals, Gulf of Mexico, Jason II, ROV on September 3, 2009 by Gaelin. Steaming in the morning, we arrived at our first station at 1100 when we got ready to begin calibrating the navigation system for the ROV Jason II. The sun was shining and the seas remained calm, a beautiful day on the Gulf of Mexico. 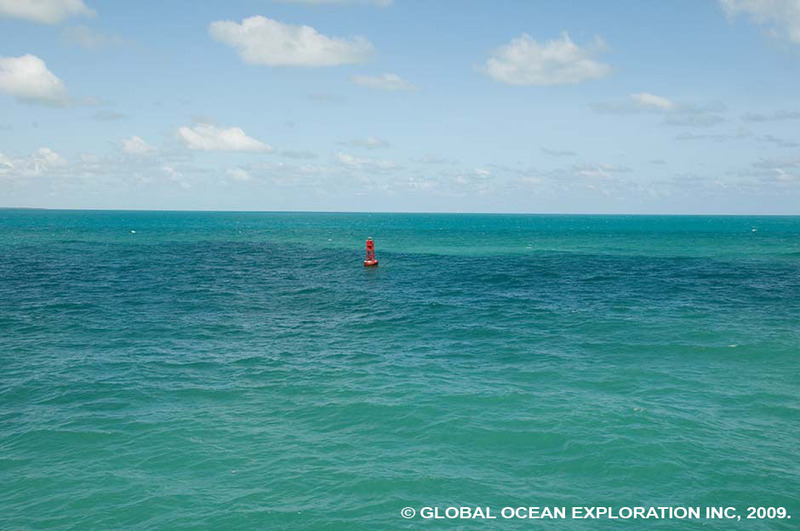 It is difficult not to marvel at the beauty of the color of the water surrounding the ship. 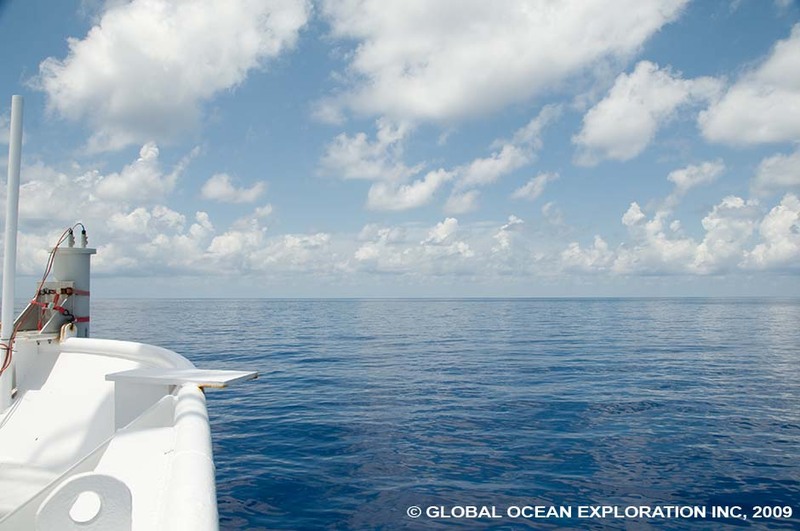 With puffy cumulous clouds in the distance and the pale blue sky, the deep blue water is inviting and tranquil, even with the gentle swell. Looking over the side of the ship, the rays of light penetrate in thousands of rays showing how clear the water is with bits of sargassum passing by. I am constantly looking for fish. With the sun setting, the Jason II was ready to go into the water. 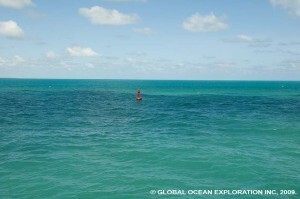 We are on the West Florida Shelf in about 500m of water. 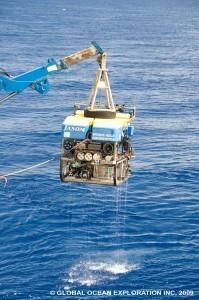 The crane lifted the ROV and deposited it in the water, lights switched on and behind the ship it went. The Jason has a counter weight, the Medea to keep it on course despite the movement of the ship and the seas. Medea was deployed right after Jason and the two began their slow descent into the depths. 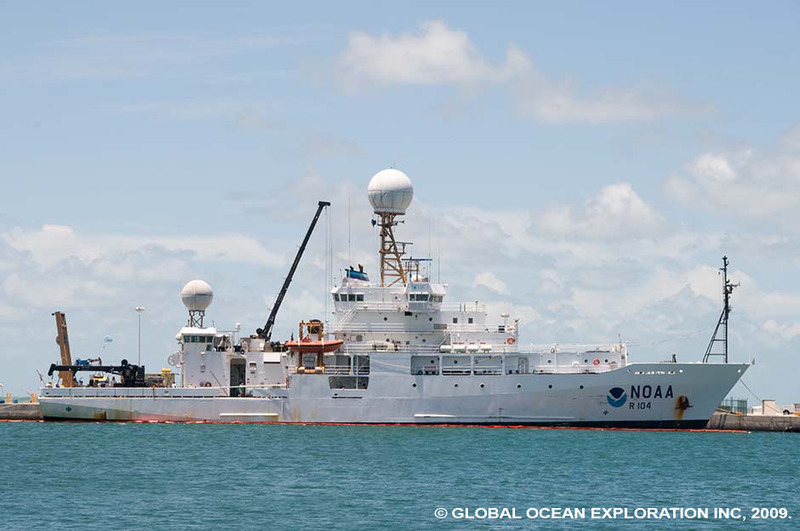 Medea is equipped with cameras as well so it can keep an eye on the operations and location of Jason as she cruises along the sea floor looking for corals and other marine life. The first station is only 500m so it did not take long for the Jason to reach the bottom. 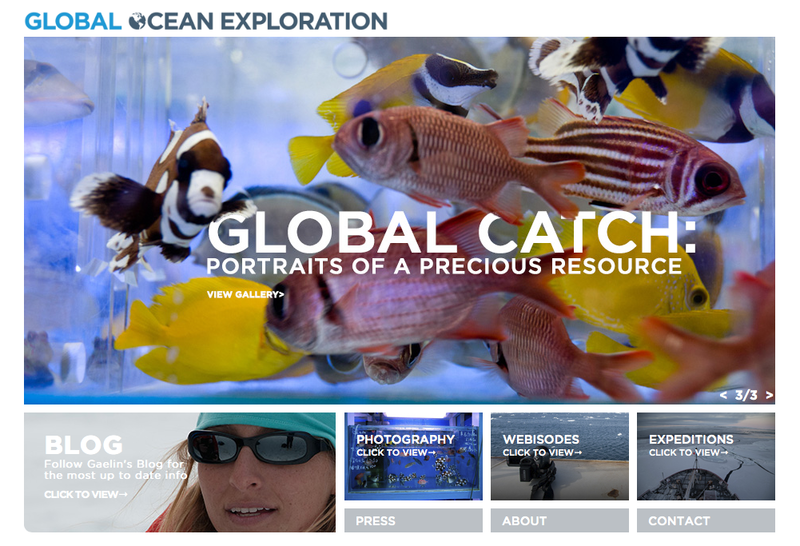 Then the images started to come through…first only hard substrate but then corals, fish, crabs, squat lobsters and other critters. 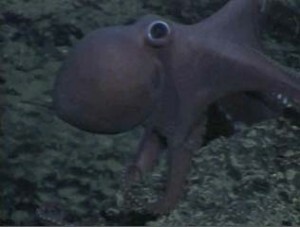 A squid came to check out the ROV and hung out in the lights for a little while. 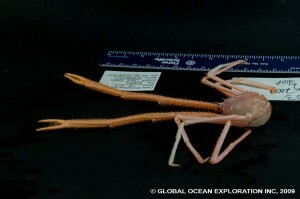 It is amazing how many critters cover the sea floor. 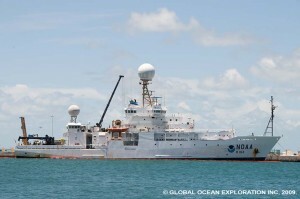 The deployment will be twenty hours so there should be lots of great footage and images. The scientists have never been to this site, in fact no one has, so it should be very interesting to see what we find. 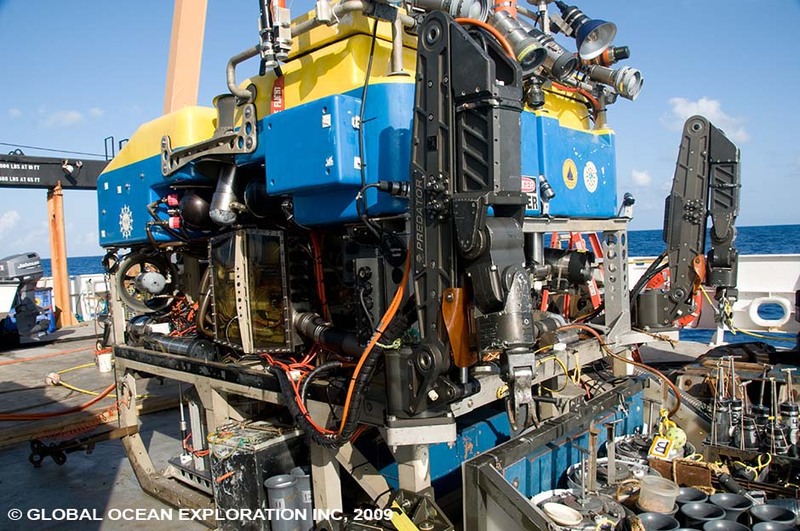 This entry was posted in Deep Sea Corals and tagged Deepsea Exploration, Gulf of Mexico, Jason II on September 3, 2009 by Gaelin. 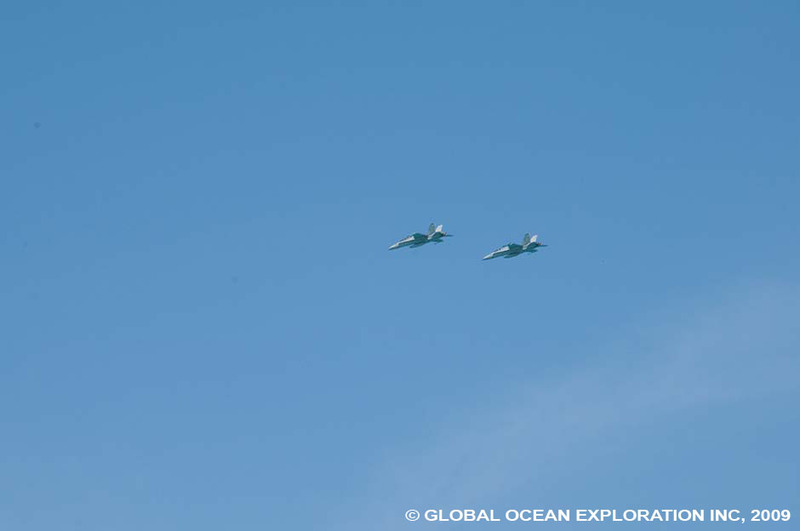 Leaving port was complete with a flyover…very cool. 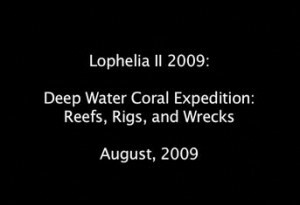 This entry was posted in Deep Sea Corals and tagged Flyover, Key West, NOAA ship Ronald H Brown on September 3, 2009 by Gaelin. 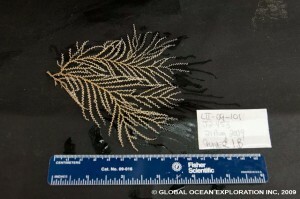 This entry was posted in Deep Sea Corals on August 19, 2009 by Gaelin.